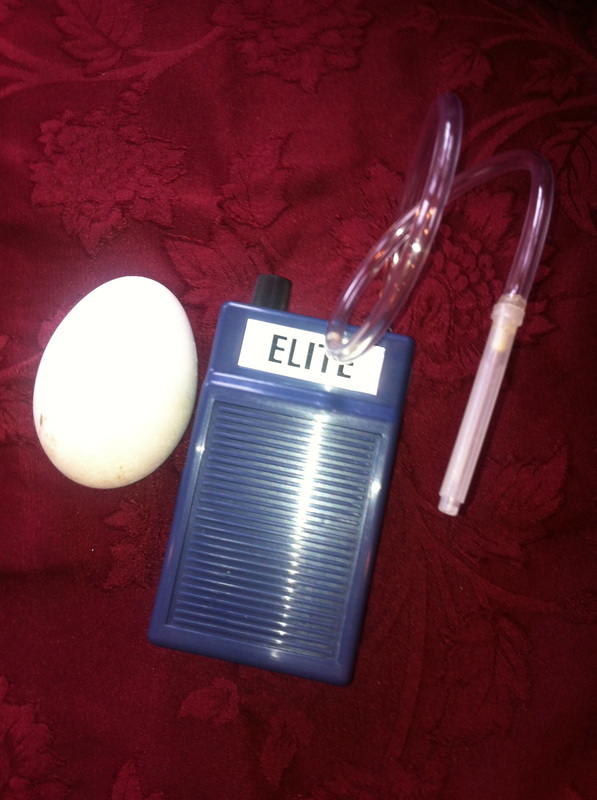 The eggs are first washed in water and a little mild Ivory soap to remove the organic matter left from the nest. A second wash of diluted vinegar is applied to remove the sticky outer layer that is present on an egg, called the 'bloom'. It is this coating which seals the egg so that the pores allow air in, but bacteria and moisture are kept out. When eggs are not washed, the bloom protects them and they can be kept unrefrigerated, but in a cool place out of the direct light, for a long time. Once washed, the egg will spoil quickly. 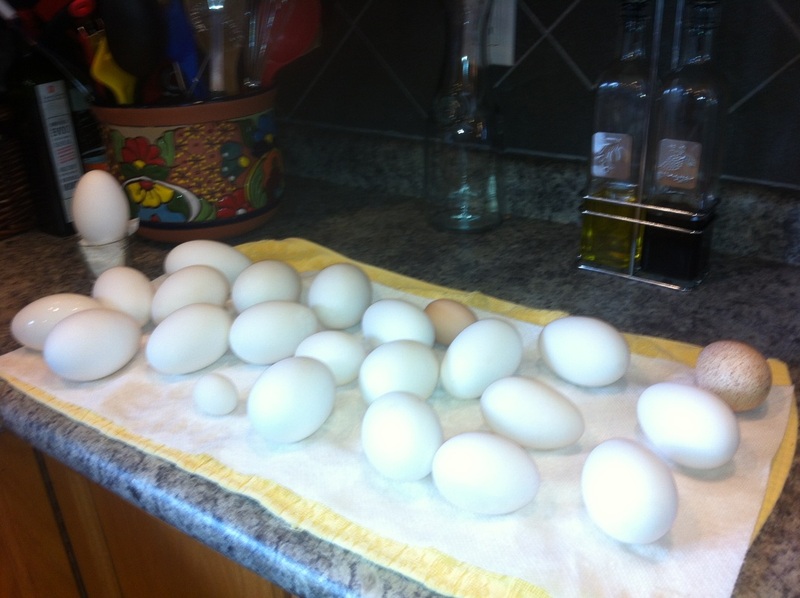 Pictured here are chicken, duck, turkey and goose eggs, washed and ready for the next step. 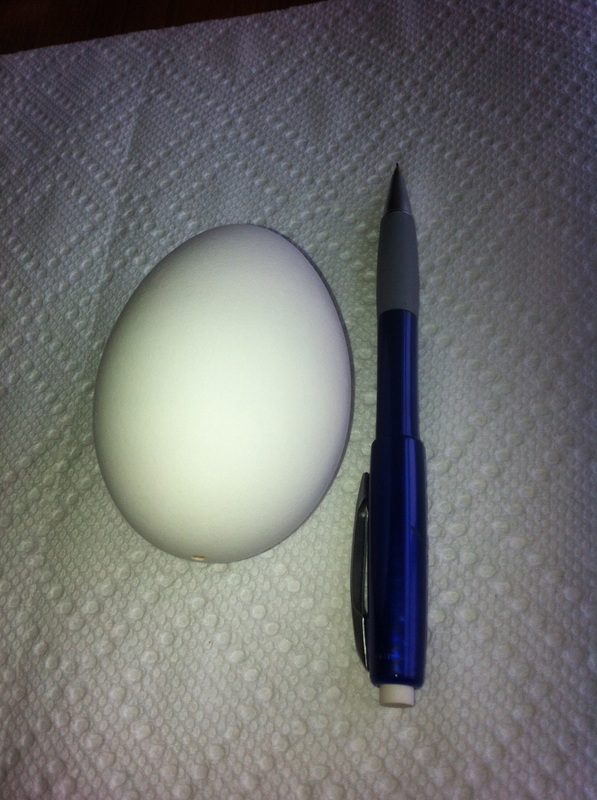 The egg is punctured with a small tool to make a small hole in the bottom of the egg. Using a fish pump, the inside of the egg is flushed out and the egg is rinsed once again in a mild vinegar wash and left to dry overnight. The shell of an egg is nearly 100% calcium and is very stable, able to last many many years once the organic matter is released from the inside. The design is applied with a pencil. 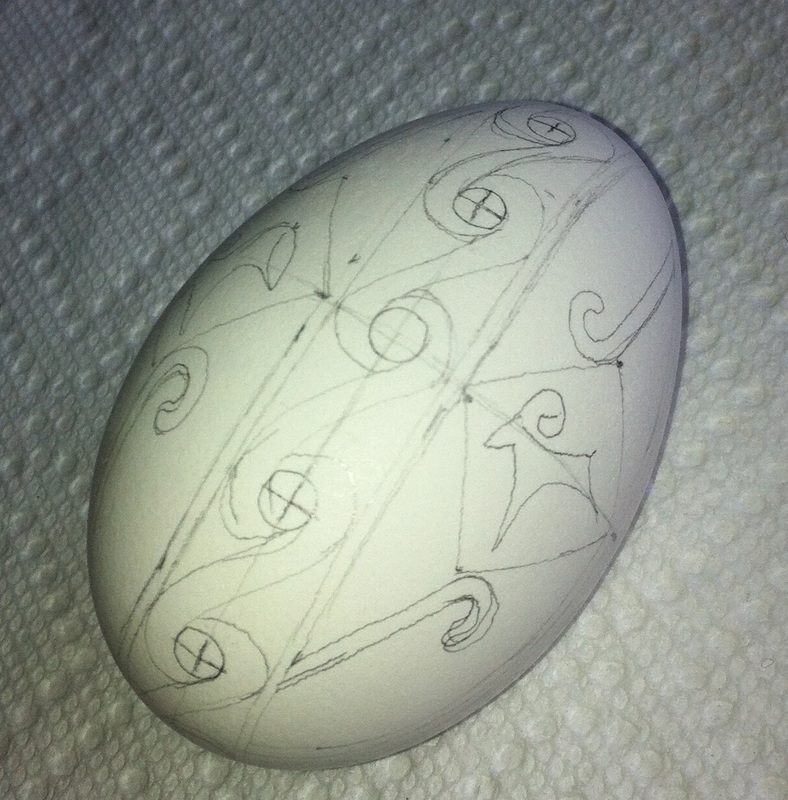 Jeannie chose a Trypillian design for this egg. The Trypillian culture is an ancient one, with artifacts dating back more than 5000 years. It was a peaceful matriarchal society and their main deity was an Earth goddess. 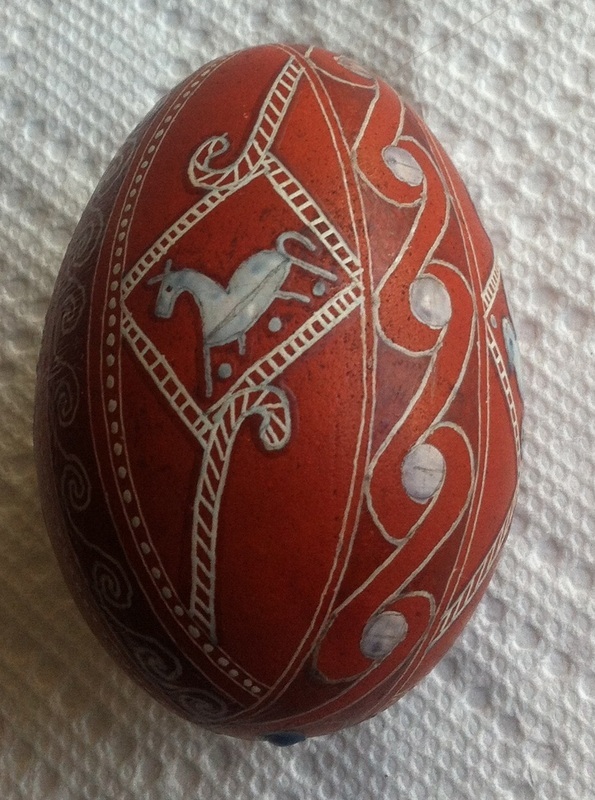 Women made beautiful pottery and decorated it with beautiful stylized designs, which have been copied and handed down generation to generation, and now can be seen in the incredible Pysanky created here by Jeannie. There are 3 colors to a Trypillian egg - white of the egg, a dip in brick dye and a dip in black dye. The design is drawn out in pencil first. Note the ram symbol, which depicts leadership and strength, perseverance and dignity, and perhaps the idea that the Fat Ewe Farm has many beautiful sheep. The straight parallel lines that are unbroken depict eternity, while the ladder is symbolic of rising above the Earth. Circles are the heavenly bodies and spiral demonstrate immortality. The symbols are ancient and predate Christians for thousands of years. 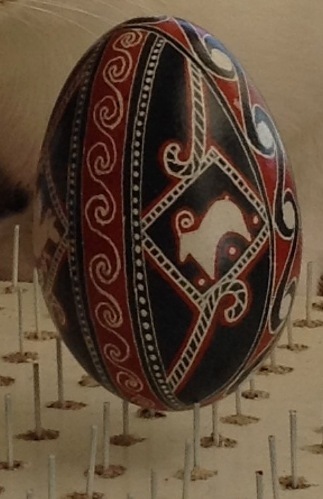 To create areas which are not coloured, the artist must apply a wax resist to the egg prior to dipping in the dye. When many colours are used, the colours are added one on top of the other. In this egg, the colour white represents purity and birth. Red depicts divine love. Black is all colours together and is infinity or infinite creation, all love in the universe. The final process is to melt off the wax with a candle flame, wipe off and apply a coat of non-waterbased varnish. The egg is left to dry on a custom-made drying rack. 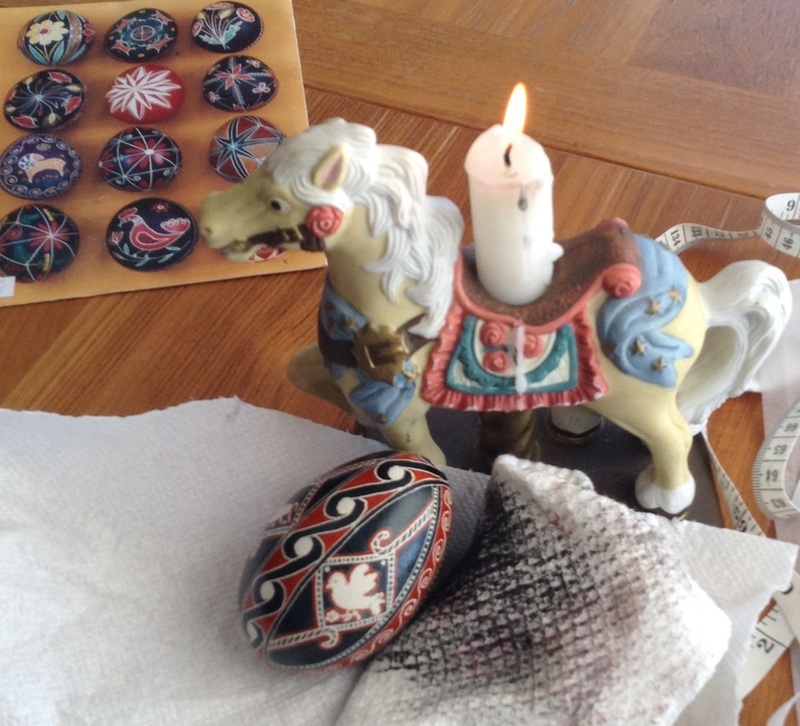 Jeannie uses the process to decorate traditional Pysanky style eggs. She may be contacted for custom work or to purchase works in progress or completed. You can contact her through her email canadianfarmgal@gmail.com. Special thanks to Jeannie from The Fat Ewe Farm for creating this masterpiece, which will be on display at the Bed and Breakfast for all the guests to admire!